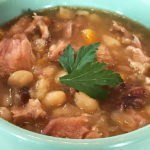 Instant Pot Ham and Bean Soup – the perfect way to use that leftover ham bone! After a big ham dinner, I always throw the bone and any bits of meat falling from it in a ziplock bag in the freezer. A bowl of delicious Instant Pot ham and bean soup. I typically pull it out and throw it in the crock pot or Instant Pot, along with a few frozen vegetable remnants, and make stock. But this year, I decided that I would use up the frozen ham bone in a different way. It was time to make Instant Pot Ham and Bean Soup. A frozen ham bone just out of the freezer. To be honest, I have never been a fan of bean soup. The dislike stemmed from my childhood. I remember that distinct smell as I walked into the house as a child as it cooked on the stove. I had never even taken a bite of ham and bean soup. But the smell immediately had me begging for my neighborhood friends to invite me to dinner. I have since learned to love all types of beans, especially if they are made in the Instant Pot. The texture and flavor are more tolerable to me than when they are made on the stovetop or in a slow cooker. 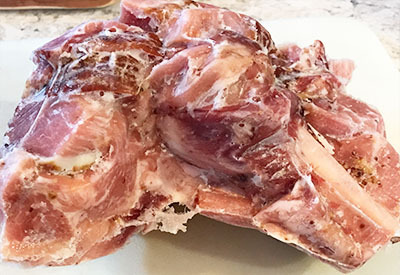 All the ingredients are in the Instant Pot – including the frozen ham bone ready to be cooked. 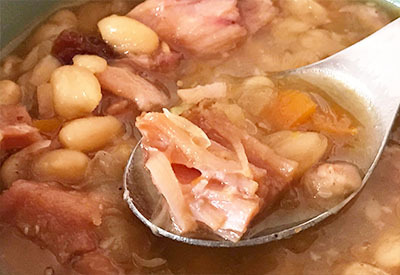 So this year, I decided to pull out that frozen ham bone and give Instant Pot Ham and Bean Soup a try. WOW!!!!! I have been missing out on the amazing flavor of this soup for years! An added bonus for me….the smell is kept within the Instant Pot until it is time to open up the valve and lid. And since it has completely cooked, the smell of beans cooking on the stove isn’t the predominant smell. It is complimented with the smell of the ham and veggies. A delicious spoonful of ham and bean soup. 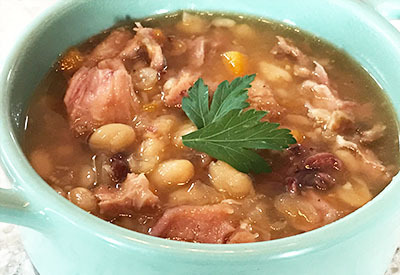 So next time you have a ham bone and aren’t sure what to do with it, you must give this Instant Pot Ham and Bean soup a try! It’s made in minutes and is absolutely, mouth-watering delicious! Delicious ham and bean soup made with leftover ham bones/meat in the Instant Pot. Add all ingredients to the liner of the Instant Pot. Stir. Put the lid on, and knob to sealing. Press the Beans/Stew button or Pressure Cook/Manual on high for 50 minutes. When the cooking time is up, push cancel to turn off the pot and natural pressure release for 20-30 minutes. Quick pressure release any remaining pressure with a controlled release done in short spurts. 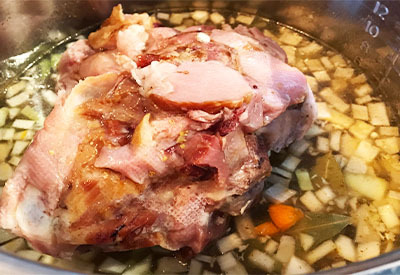 Remove ham bones and bay leaves and stir. Hello! So since you specified 1 lb of beans, instead of cans, I’m guessing that you put them in dry? Or am I assuming wrong? Yes, the recipe is for 1 lb. of dried beans. Great tip! Thanks for sharing it with us – I will have to give that a try. Question. If the hambone isn’t frozen… Same cook time? Yes, the cook time will remain the same. Can I use chopped ham in leu of hambone? Made this for dinner last night and everyone loved it! One comment – this recipe is a keeper Mom, don’t loose it! Will this work for 6 quart instant pot? I’m just learning and didn’t want an explosion lol. Absolutely! We use our 6 quart for this recipe all the time. Im trying this today sounds yummy!! I hope you enjoyed it as much as we did! Can you substitute canned beans? Same cook times if so? If you use canned beans you will need to reduce the time to 5 minutes on High Pressure. You can do a controlled quick release – just do it slowly so it doesn’t splatter. Just be aware that the original recipe with dried beans will be much more flavorful because of the time spent under pressure. But in a pinch, canned beans would work.